Brian Reidy, Galway Bay Sea Angling Club, with a decent flounder (38cm). 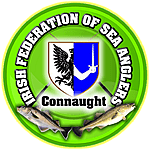 Connaught Council of the Federation caters for boat & shore fishing within the province for all age groups & abilities . Findlater, Interprovincials, HN boat 2017 To our Sponsors, Thank You!